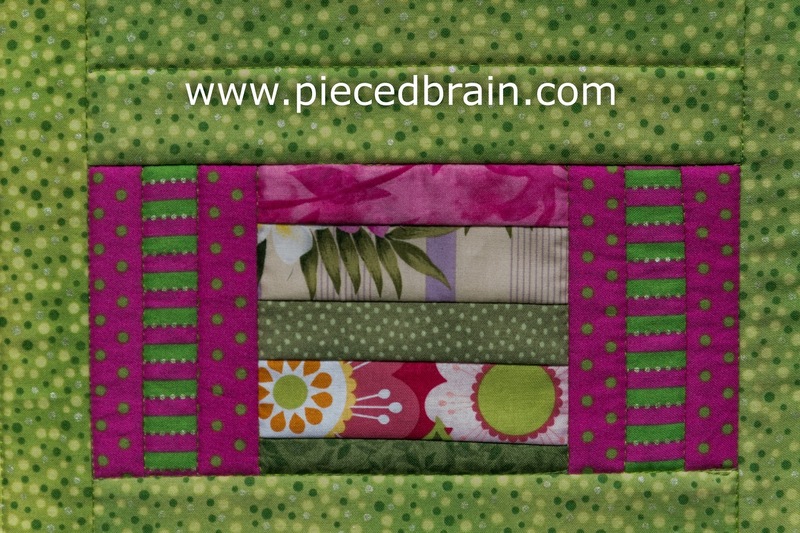 Here's one more project I made, using already cut strips from my stash, for the Strip-easy Quilt Challenge. I could only get three squares from the strips I stitched together and wondered for a while how I could use them. Their colors reminded me of the Lakehouse fabrics I had purchased way back in 2006 I think. 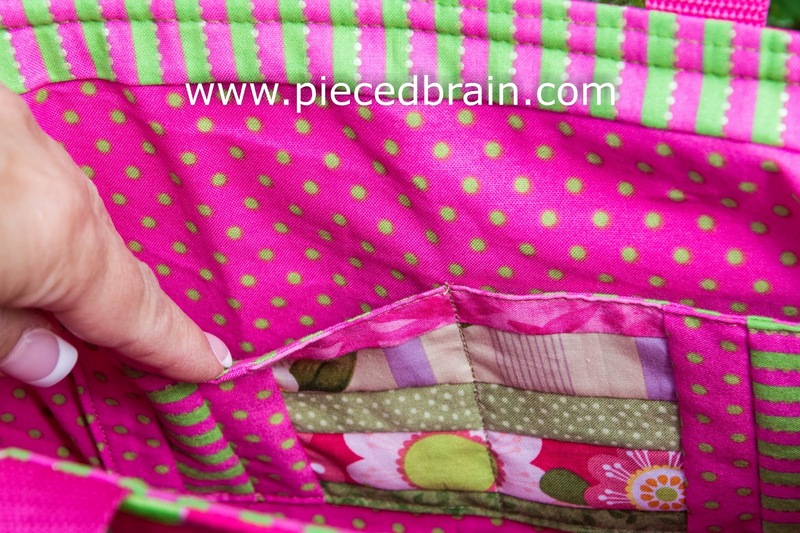 With all the other strips I found, I decided on a tote with pinks and greens, with one square of the original strips on each side of the bag, and one for the pocket on the lining. I used Soft and Stable by Annie (I found it here) instead of batting, which gives body and lightness to the tote. The handles are made of polyester, so they are sturdy and durable. I did quilt it using the walking foot, which was a breeze. I am keeping this tote for myself, as its size (It measures 13" x 12" ) is perfect for carrying small projects, my laptop, Kindle, etc. How are you managing your leftover fabric strips? I am sure you will get great ideas for using them during the Strip-easy Quilt Challenge linky party coming up here at this blog on May 28. Mark your calendar. Wishing you a lot of stitching fun today! very cute tote. Is the Soft and Stable something you can get at JoAnns or do you need to get it on line? Haven't seen it yet, of course I wasn't looking and it didn't jump off the shelf into my cart on it's own as I passed. 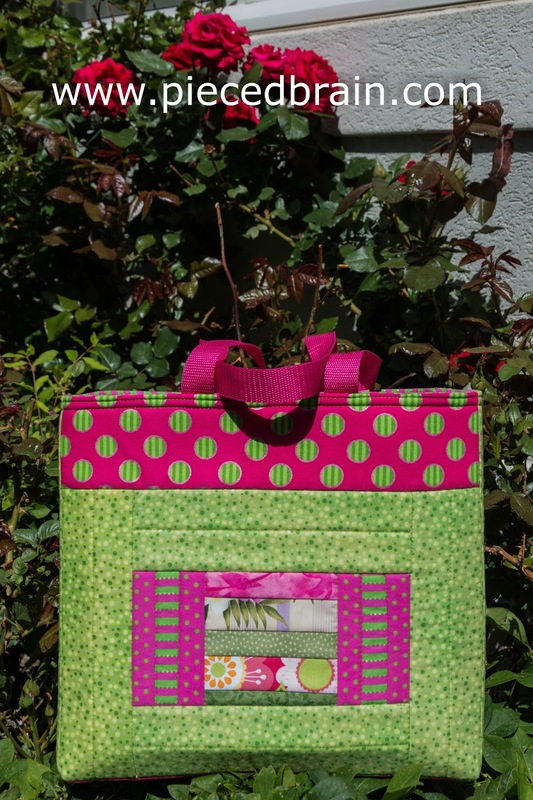 Such a beautiful tote and love your fabrics combo! Handy tote and sooo cheerful! Very cheerful colors, cute design. I like that size too. I'd be keeping it for myself because it is so cute and nicely done. Don't you just hate parting with your creations--especially when it's a challenge. What a sweet bag! Lovely combo.